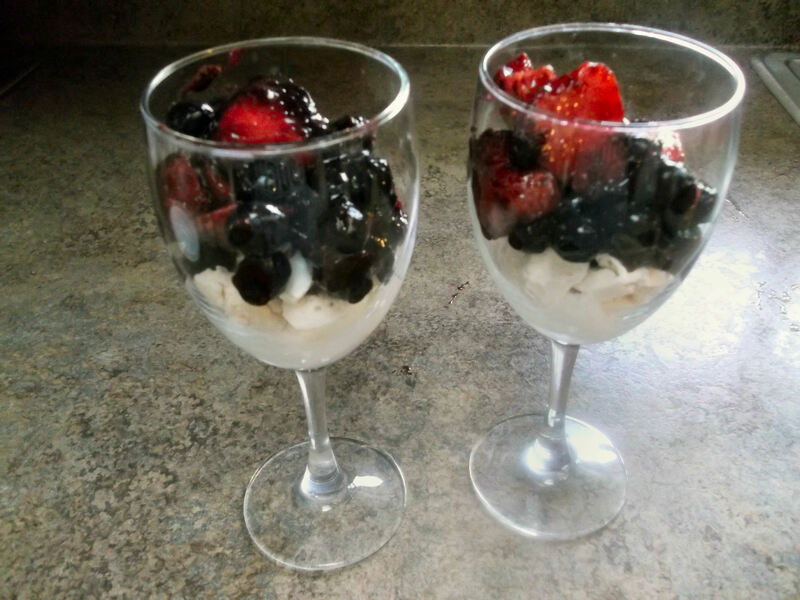 We got several great ideas for recipes, techniques, and all things Dinner Party, but one dessert kept making an appearance: Eton Mess (apparently named after Eton College, where it was first served, although I prefer to think of it more as an Eatin’ Mess). Several of the contestants made this dessert, and it was always a big hit. I happened to see a recipe for it and decided to try it. 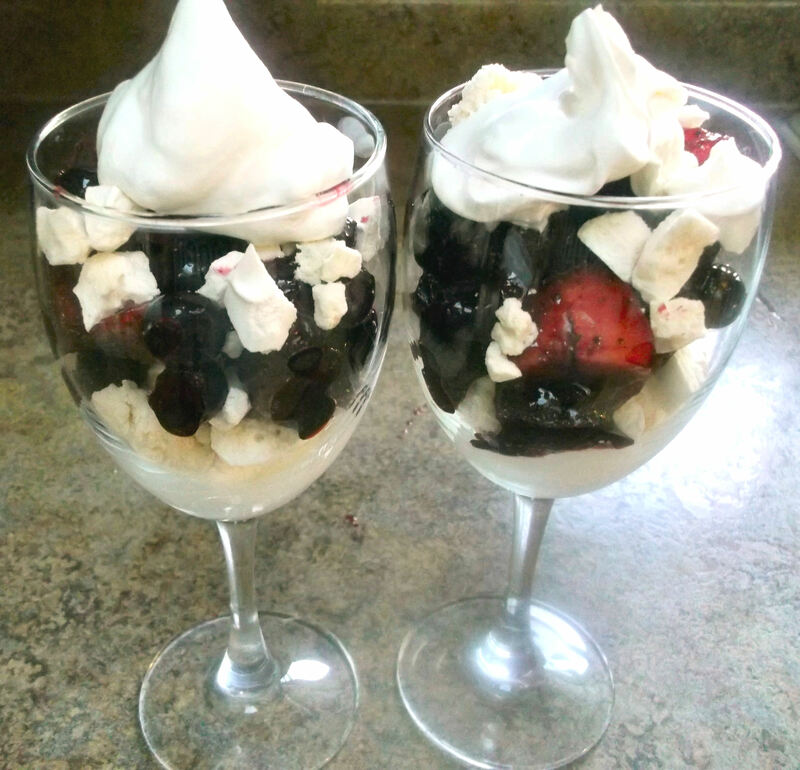 What a great way to use fresh seasonal berries! 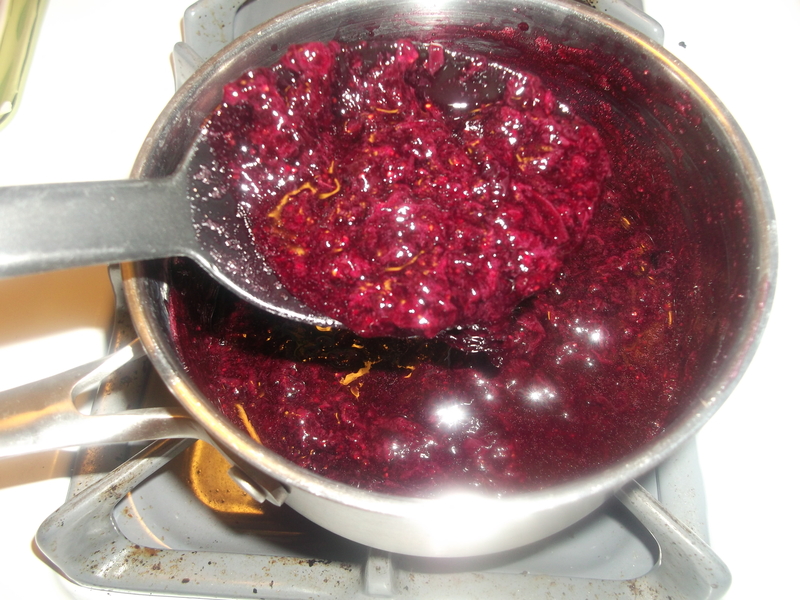 The link to the original recipe is here, but I have modified it to make it easier to make and much lower in fat. 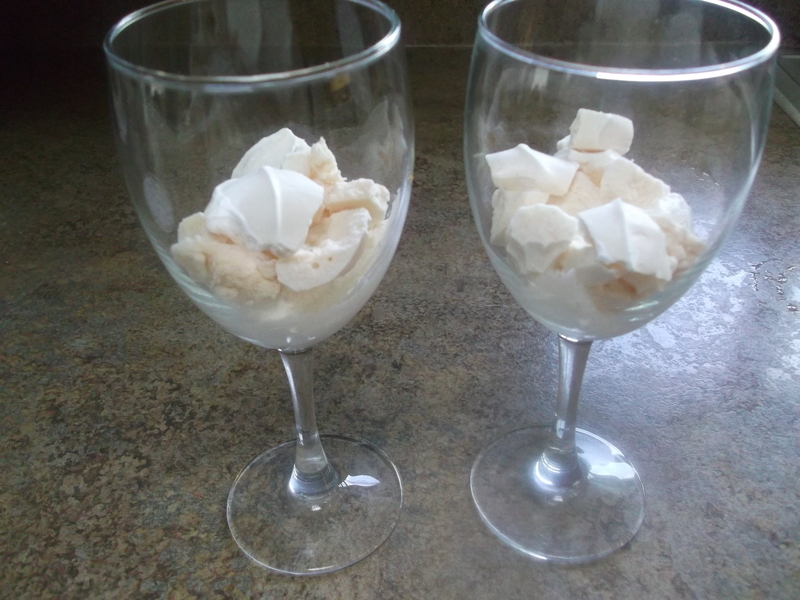 In a medium bowl, whip the cream and vanilla (and sugar, if using) until stiff peaks form. This is easiest using a whisk attachment on a hand mixer, stand mixer or handheld immersion blender. 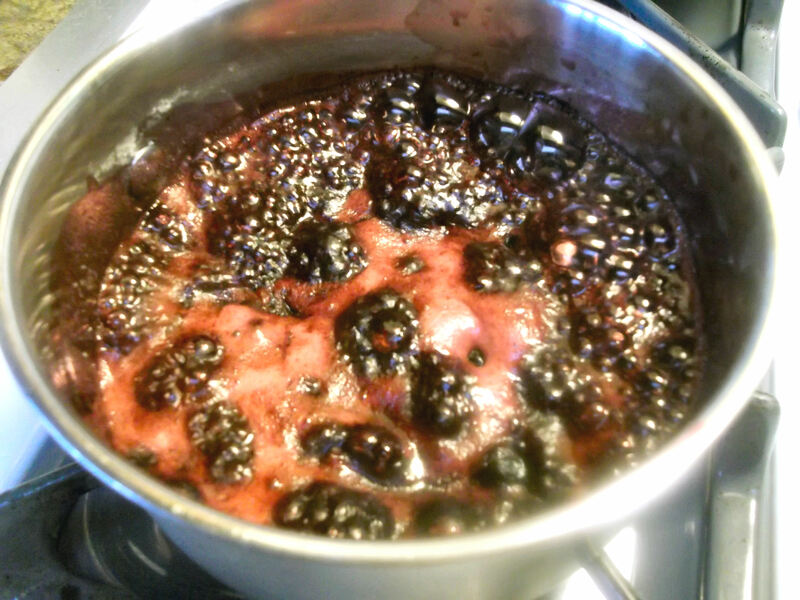 Bring to a simmer and cook until it gets a little foamy and when most of the berries have softened and mash easily against the side of the pan. It will be a little thick and soupy. 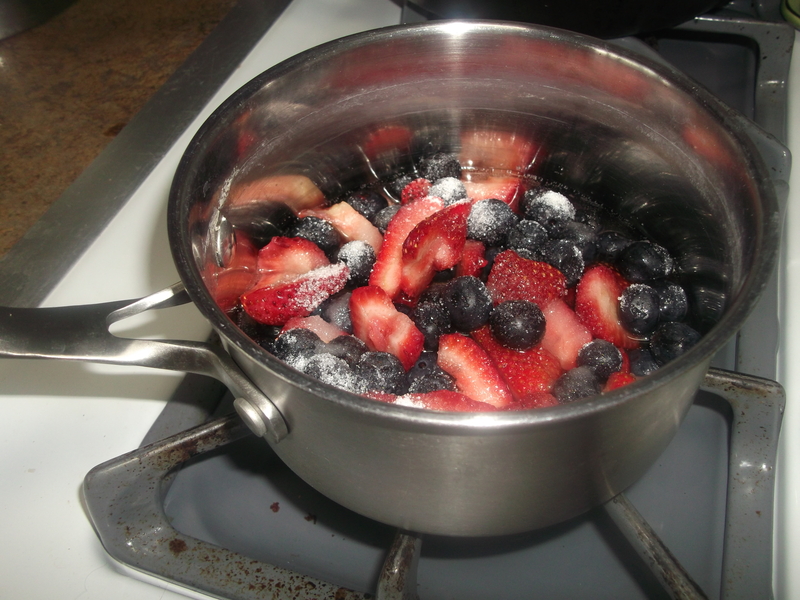 Stir in the remaining fresh berries, mix well, and refrigerate until chilled. Now onto the meringues. I made my own the first time I made this dessert, but it was very time consuming, especially once I discovered them already made at the supermarket. 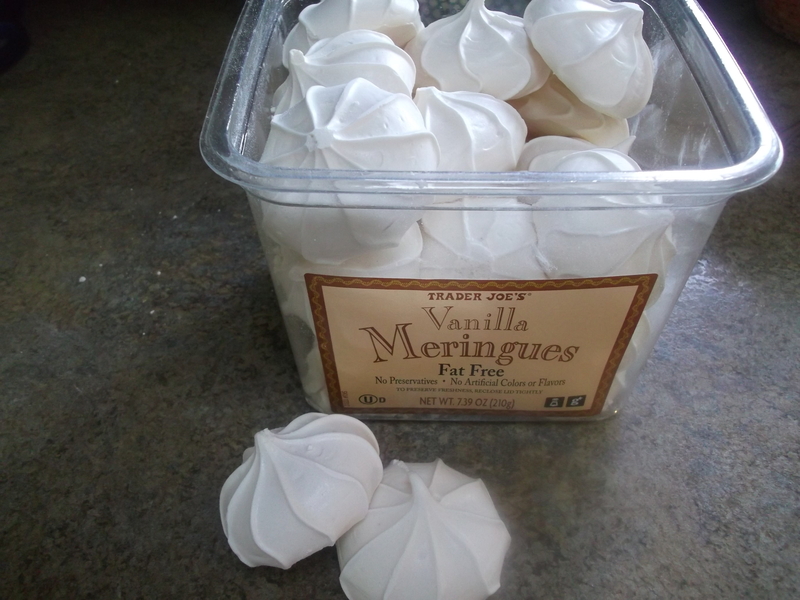 I absolutely love these vanilla meringues from Trader Joe’s. They last forever, too, if you don’t gobble them up right away. 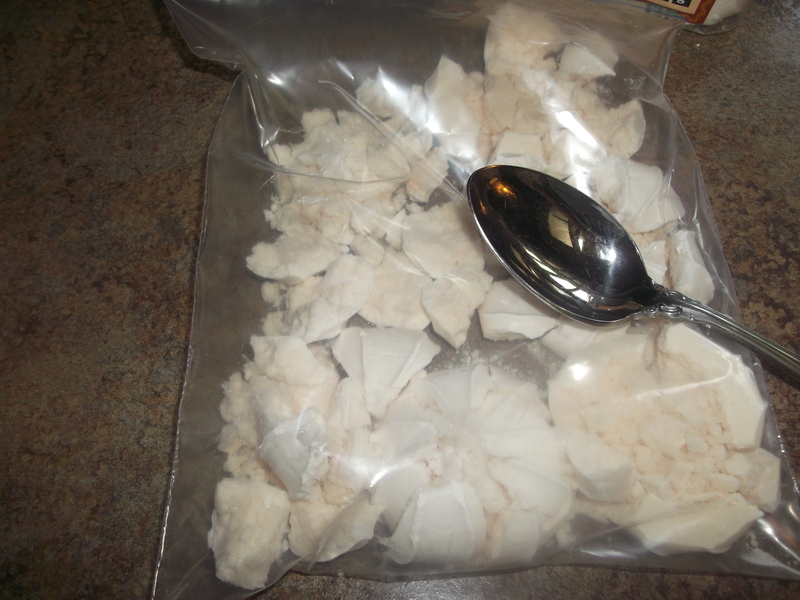 Take a few of the meringue cookies and place them in a plastic ziplock bag. Gently crush the cookies by squeezing the bag or tapping on the cookies with a spoon. (Or you can crush them with your hands.) Don’t pulverize them: you want them in chunks, not powder, and they should be about the same size as the solid fruit pieces. Repeat this step until you have about two cups’ worth of crushed cookies. To serve, assemble the desserts in whatever serving dish you choose. 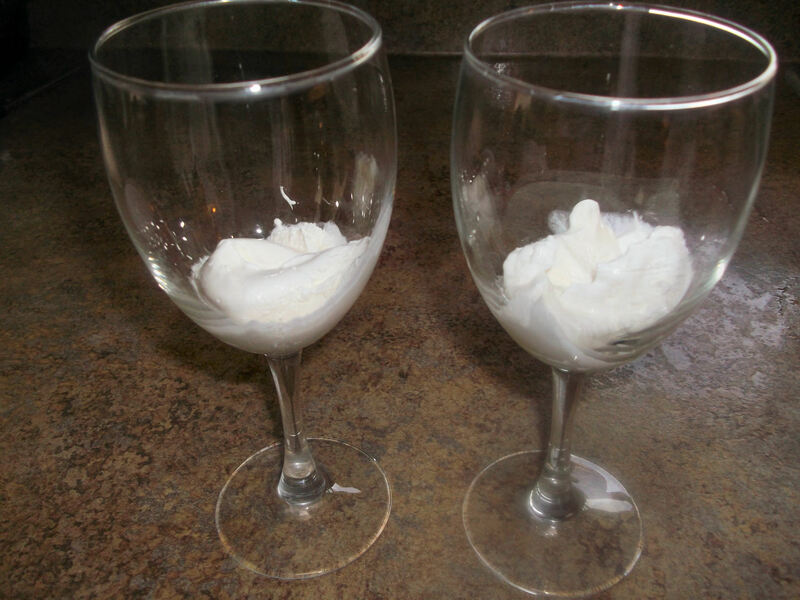 I use wine goblets for guests for the extra “Wow!” factor, but just use any old bowl when it’s just for me. 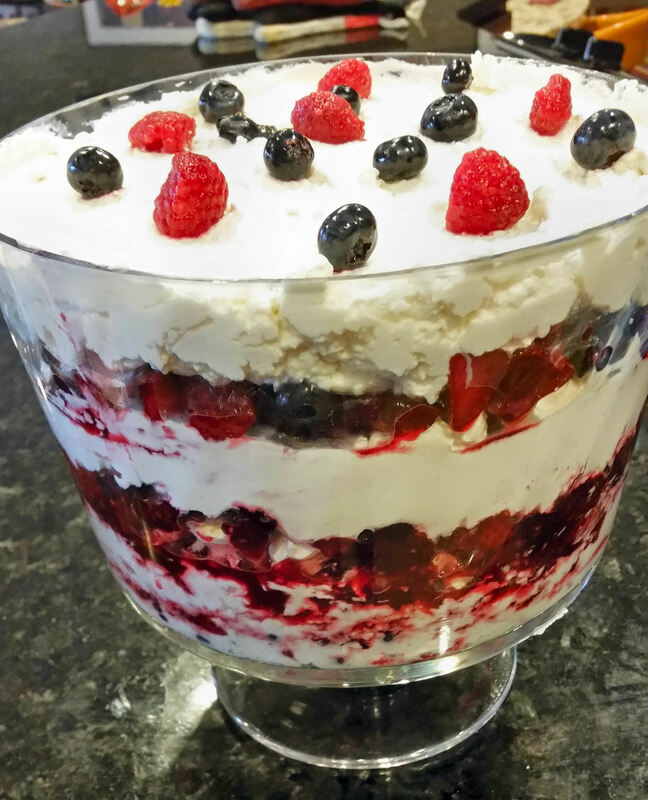 And for a large group, I double the recipe and layer it in a glass trifle bowl (shown below). 2) Add some of the crushed meringue cookies. 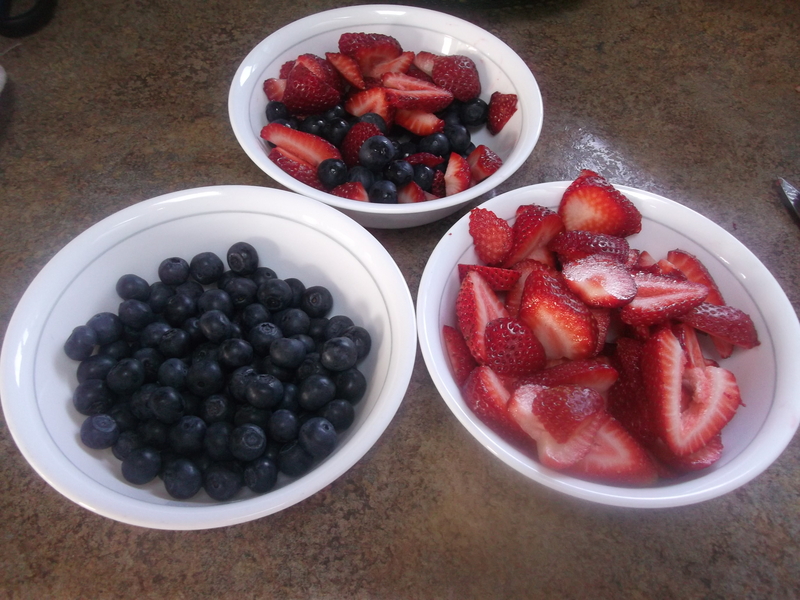 3) Top with the berries. 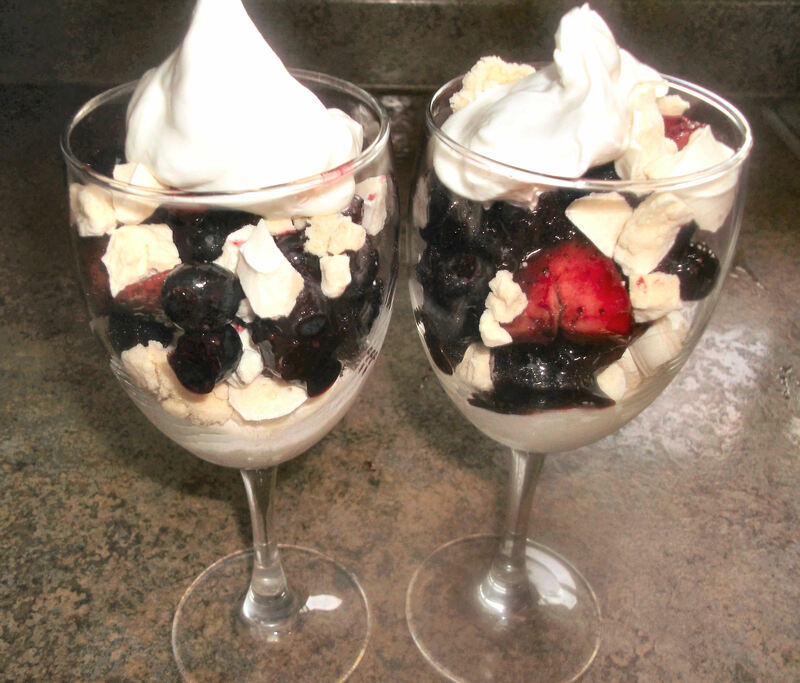 To serve this for a party, double the recipe and layer it in a glass trifle bowl, adding a layer of whipped cream after each berry layer. Adding this extra layer helps hold everything together a little better, so it’s easier to spoon out individual portions, but note that this extra layer may cause the meringues to get soggy, so assemble the dessert shortly before serving. (Guests love to watch it come together, too!) Enjoy! P.S. Not that this is likely, but in the event that you have any leftover, either refresh it the next day with more meringues, or stir it all together and freeze it for a fruity kind-of ice cream treat.